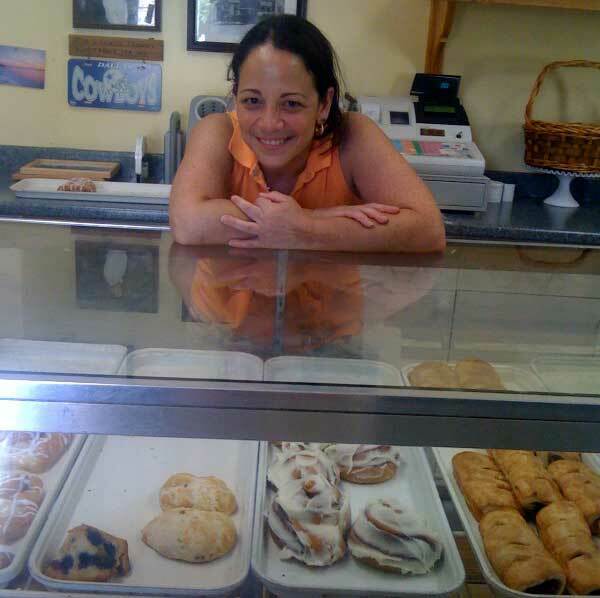 Meet Yvonne Segarra of ShiningStar Bakery in Center Moriches. Yvonne was featured on the first episode of “Mary Knows Best,” in which she informed Jackie that Mary had announced on her radio show, “Angels on Call,” that she was looking for a single man to date Jackie. Yvonne, who has owned the bakery for six years, has the brightest, most welcoming smile in Center Moriches. Some of the bakery’s include frosted star cookies, back and white cookies, brownies and seven-layer pastries. She also serves breakfast and lunch, and caters for special occasions. If you come to downtown Center Moriches, make sure to stop at Yvonne’s shop. It’s located at 430 Main Street, Center Moriches, NY 11934. Call her at 631-909-4089. Thank you Yvonne for all you do. Posted on July 24, 2010 by Mary Occhino in Etc.